Disclaimer: my brother’s bar mitzvah was Star Trek themed. As he is five years older, I grew up unwittingly watching endless rounds of Trek episodes on TV from a young age—of which my parents approved. Suffice it to say that the indoctrination started early, and although my exposure was passive, it was very formative. I even went to space camp at the tender age of 10, and was determined to become an astronaut until age 13, when my poor vision ruled that out. Not gonna lie, I cried when that dream was crushed. So, cut to the present day and “Star Trek: Into Darkness.” Zoom in on Chris Pine (Captain Kirk) and his shockingly blue eyes. Cue J.J.-Abrams-trademark lens flare. Watch the primitive humanoid alien population of a far-distant planet, wide-eyed and loin-clothed, develop new ritualistic behaviors and cosmologies based upon the sighting of the USS Enterprise rising out of the ocean, manned by a crew of what I’ll term “intergalactic anthropologists.” (I majored in Anthropology, so this is my jam). Swoon. In the ensuing ruckus, consider the question: is it more important to preserve endangered populations and ways of life, or to allow all life forms to develop on their own, uninterrupted by outsider intervention? A central concern of anthropologists is the application of knowledge to the solution of human problems. Spock believes in preserving life, as long as outside influences are not registered in the cultural history of the population—a kind of “do good and leave no trace” anthropological ideology. (Classic Vulcan—and classic civilizational superiority complex.) Captain Kirk believes in going with his gut; he isn’t much of an anthropologist, just a good-looking roguish dude who likes to keep his friends alive and adventures forever on the horizon. Captain Pike, an old-timer, believes in adhering to the rules, which are strictly observational; more science than ethnography. Cut back to Chris Pine’s dreamy eyes. 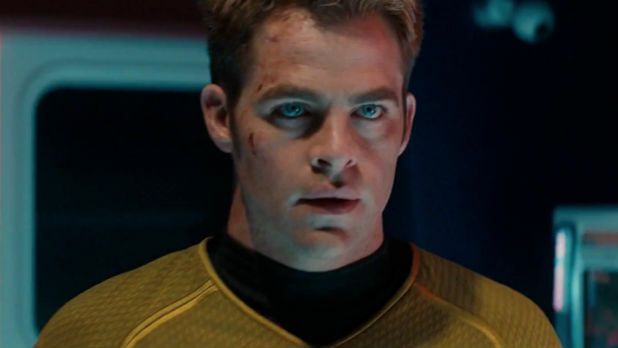 Since this is Star Trek and Chris Pine is always getting beat up, he’s been in a fight since we last saw him on screen. Notice the subtle black eye he’s sporting, and gratuitous facial lacerations. He looks great. If you saw “Star Trek: Into Darkness,” the other parts of the movie that mesmerized you were most likely the special effects and the good-vs-evil storyline. There were laser guns, explosions, and lots of high-stakes sound-enhanced hand-to-hand combat. Throw in a cold-as-ice unbeatable villain (Benedict Cumberbatch), advanced military weaponry, and a hot shirtless blonde—and you have all the makings of a solid summer blockbuster. Star Trek’s premise of exploring new worlds is geeky at first, but in the hands of Hollywood it gets the royal action-movie treatment. And with a plot that pits ideology against ideology—pre-emptive warfare vs. adherence to legal and moral codes—it even resonates gracefully in our contemporary post-9/11 consciousness. Now that’s a cinematic franchise for the anthropologically-inclined. It doesn’t hurt that it’s got lots of Captain Kirk to gaze at, and Spock to bestow us with subtle lessons in cultural stewardship. Needless to say, I’m looking forward to the next Trek installment. Intergalactic anthropology: definitely my dream job.